Manhattan Projects sheds new light on the rise and fall of New York's urban renewal in the decades after World War II. Focusing on four iconic "Manhattan Projects"—the United Nations building, Stuyvesant Town, Lincoln Center, and the great swath of public housing in East Harlem—the book unearths a host of forgotten stories and characters that flesh out the conventional history of urban renewal. It shows how boosters hoped to make Manhattan the capital of modernity and a symbol of American power, but a chorus of critics revealed the dark side of those Cold War visions, attacking urban renewal for perpetuating deindustrialization, racial segregation, and class division; for uprooting thousands; and for implanting a new, alienating cityscape. Here, urban renewal was not merely a failed planning ideal, but also a crucial phase in the transformation of New York into both a world city and one mired in urban crisis. 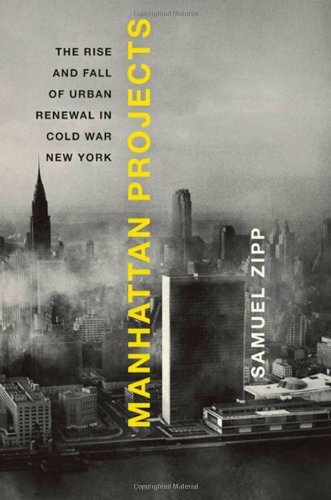 Samuel Zipp is an urban and cultural historian interested in the intellectual and political history of the built environment, United States history since World War II, visual culture, the history of urban planning, and nonfiction writing. He has written articles and reviews for a number of publications, including the New York Times, the Washington Post, Metropolis, Cabinet, the Baffler, Southern California Quarterly, and In These Times. He earned his PhD in American Studies from Yale University, has taught at Yale, California State University at Long Beach, and the University of California, Irvine. He is currently assistant professor of American civilization and urban studies at Brown University.